Furniture goes separately from the dollhouse! If you have been searching for an heirloom-quality classic wooden-furniture we have made it for you! Miniature homes filled with furniture and tiny people have been around for thousands of years. It is not just the acting out scenes that delight children; it is also rearranging the dollhouse furniture in such a way that it pleases their personal tastes and also allows them to create the scenarios they want. During pretend play children use symbolic representations for the objects they are exploring. As they act out different scenarios, they will create scripts for the different characters in their play. These will help them to understand how people communicate with each other and also about different social situations. This Wooden furniture is 100% handmade. It is a great gift for your child, is eco Friendly, Unique, hand Crafted, safe for children. 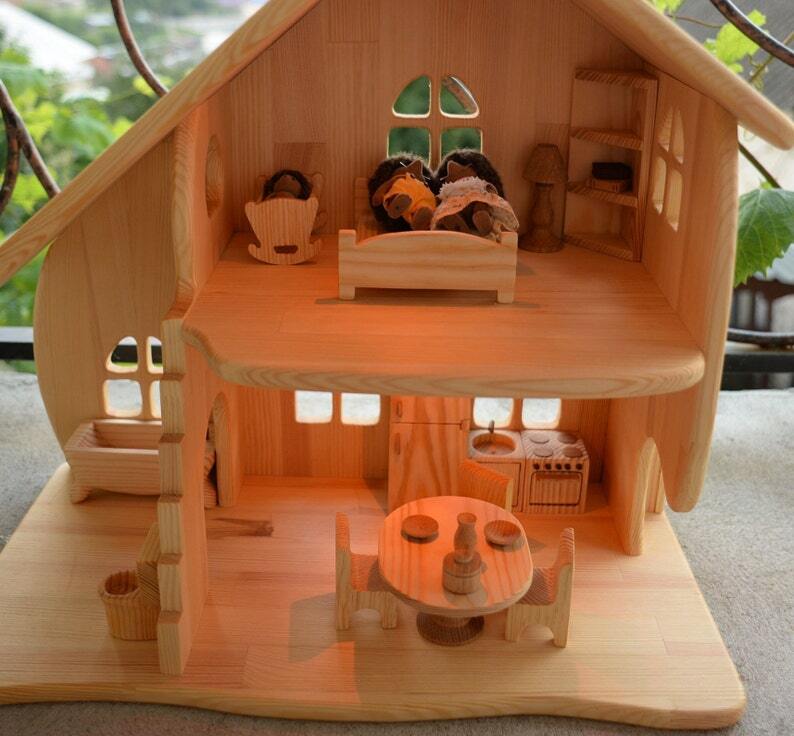 This furniture is fit for dolls 10-12cm/4-4.8in tall. Made of a natural pine-wood. We recommend not to leave children under 2 years of age for safety reasons, but you can be sure that even if the child wants to climb to the roof, the roof will not break or fall apart, the windows do not beat out. This house is made by the best masters with all the features: it is solid and will not fall apart when you play, rounded edges, holds a bunch of toys. Absolutely adorable furniture! My four year old is so in love with it. It stained beautiful and feels sturdy. This is going to get years of play!